On April 11, 2018, the 6th session of the 13th Supreme People’s Assembly (SPA) of the DPRK convened at the Mansudae Assembly Hall in Pyongyang, featuring a general report on the economy and a report on the state budget. Such meetings take place annually in spring, and neither the parliamentary session nor its timing this year was particularly extraordinary. However, this SPA session was preceded by a meeting of the highest body of the Korean Workers’ Party, the Politburo, on April 10, during which time the budget report was “examined and ratified” (검토비준하고). It is more than likely that the Party had pre-approved such documents in the past, although it was not customary to report this in state media. Highlighting this step in public discourse may be interpreted as a further step towards publicly re-establishing the rule of the Party that had lost its dominant influence during the Kim Jong Il era to the National Defense Commission. The revival of the Party started in September 2010 with the very Party Conference—the first after 44 years—where Kim Jong Un had first been introduced to the public. Currently, the main focus of international attention regarding North Korea is on the two summit meetings that have been announced to take place between Kim Jong Un and his counterparts: South Korean President Moon Jae-in and US President Donald Trump, respectively. However, the issues discussed at the SPA session provide a superficial but rare glimpse into the inner workings of North Korea’s economy and should therefore not be overlooked. Some notable details include repeated direct and indirect reference to sanctions, indicating that they might indeed be biting; a low projected growth rate of the economy; a small but symbolic increase in military spending; and a stagnant part of the budget coming from local sources. In fact, 2018 is the first time since 2011 that this figure has not grown substantially. The trend of a constantly growing relative economic power of the provinces compared to the central state has thus stopped. In 2018, all features of the parliamentary session—its form, the way of reporting in the state media, the rapporteurs, and the announcement of personnel changes—followed the known routine of the past years. The 2018 SPA session for the second time included a report by the Prime Minister on the achievements of the Five Year Development Plan, which had been announced by Kim Jong Un during the Party Congress in May 2016. It now seems to be a pattern that this part replaces the previously common report on the work of the Cabinet. In 2017, there had been a short speech on the implementation of the 12-year compulsory education system, and the newly created Diplomatic Commission had been introduced. In 2018, no such special speeches or announcements were reported by the North Korean media. Prime Minister Pak Pong Ju’s speech included the usual brief notes on each sector of the economy, an emphasis on science and technology and a renewed call for self-reliance, as well as a few new noteworthy issues. There is an ongoing debate among policy analysts whether the tightened sanctions of 2017, this time under active participation by the Chinese, have compelled Kim Jong Un to embark on his 2018 charm offensive. This question was not answered in Pak’s remarks, but we should at least note the fact that he mentioned externally imposed obstacles twice in his relatively short speech, referring to “unprecedented massive challenges” (류례없는 엄혹한 도전) and “vicious sanctions and pressure maneuvers” (악랄한 제재압살책동). Unlike in 2017, no “acute shortage of electricity” was stressed this time. Electricity, nevertheless, remains an economic priority of North Korea’s government. In his 2018 report, Pak put the related focus on conservative policies such as equipment maintenance in power generation and a more efficient use of coal. This could be interpreted as an attempt to respond to limitations imposed by new economic sanctions, the message to the energy sector being: make the most out of what is there and do not expect to receive external inputs anytime soon. Another sanctions-related topic was not, however, explicitly addressed in Pak Pong Ju’s speech this time: the so-called C1 chemical industry. This industry, which focuses on trying to replace imported crude oil by other, domestically available resources, had been a key strategic item in various 2016 and 2017 speeches. Among the specific economic projects that Pak mentioned were the development of Samjiyon County into a model county, the Wonsan-Kalma tourist area, the Tanchon Power Station and the waterway project in South Hwanghae Province. The special emphasis on the Wonsan-Kalma tourist project supports the expectation that the North Koreans will push for a revival of tourism cooperation during the upcoming summit meetings, as discussed by Kim Jong Un during his New Year’s speech at the beginning of this year. Pak touched upon the issue again in his speech when he announced special efforts at repairing tourist roads (관광도로). The budget report was delivered by Minister of Finance Ki Kwang Ho. The rate of growth of state budgetary revenue, which I treat as a proxy for an official GDP growth rate, was given as 4.9 percent during the last year, indicating a moderate growth of the economy but being lower than the 6.3 percent reported in 2017. This could be another indicator of a certain impact of economic sanctions, although caution is advised because fluctuations have happened before and are rarely mono-causal. In any case, this is the lowest value since 2006. Figure 1. 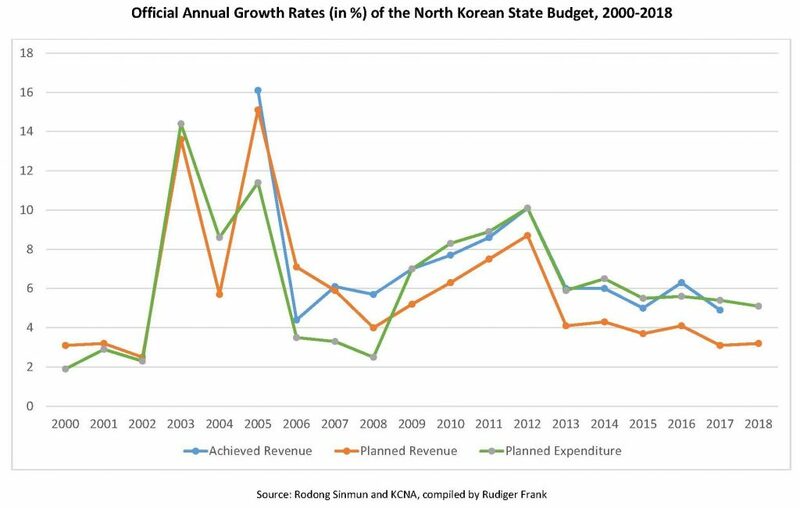 Annual growth rates of North Korea’s state budget, 2000~2018. We find that growth rates and expectations are again relatively modest, a trend that began in 2013 and has been strengthened gradually. The growth figure for 2018 is 3.2 percent, about the same value as last year. Expenditures are set to grow 5.1 percent, which is only slightly less than in 2017. As Figure 1 shows, the North Korean state has since 2008 planned to spend more than it earned. The gap between the planned growth of revenue and expenditure for 2018 has been somewhat narrowed and is now at 2.1 percent. This is, however, not a sign of deliberate deficit spending since the figures for actual, or “achieved” revenue usually make up for that gap and thus lead to a more balanced budget and occasionally even a small surplus, at least according to these official figures. The blue curve for revenue growth in Figure 1 has in 2017 been only slightly below the green curve for planned expenditure, which is usually fulfilled at 99.9 percent and thus equals actual expenditure. The surplus that was achieved in 2016 could not be repeated in the following year. We only talk about growth rates here and thus need to be careful with interpretations, but this could be another indicator that the North Korean economy is indeed suffering from the new economic sanctions introduced in 2017. In any case, the relatively higher growth rate of revenue versus expenditure in 2016 turns out to be a one-time event, not a new trend. Figure 2. 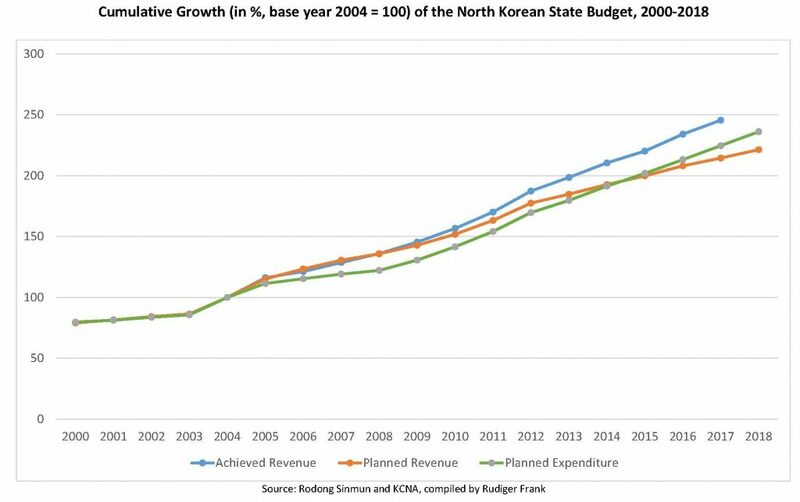 Cumulative growth rates of North Korea’s state budget, 2000~2018 (base year: 2004=100). Figure 2 shows that the cumulative value for achieved revenue (blue curve) has constantly been above cumulative expenditure growth (green curve) throughout Kim Jong Un’s tenure. Since 2013, however, the green curve for cumulative expenditure has constantly been above the orange planned revenue curve. This indicates the built-in expectation that the plan will be over-fulfilled. For 2018, revenue from special economic zones is expected to grow 2.5 percent. This is twice as much as the year before, but still only half the expected growth rate of 2014. It seems that North Korea’s leadership is somewhat optimistic about the prospects of its external economic cooperation but so far refrains from overly excessive hopes. This is an interesting insight into the internal expectations of the 2018 summitry. The military is again only briefly considered with its usual 15.8 percent share of the budget which as such, is subject to debate as being too low and not reflecting the actual North Korean spending on its military which is estimated by the US Department of State to be in the range of 24 percent. For 2018, the official North Korean figure has been increased to 15.9 percent. This is below the 16.0 percent for 2013. On the other hand, even this slight increase can be interpreted as a sign of defiance and certainly not a sign that Kim Jong Un expects to reduce military activities this year. This adds a small detail to the ongoing speculation about Kim’s understanding of “denuclearization of the Korean Peninsula,” which is one of the key phrases for the two upcoming summits. The most notable change in the detailed numbers concerns the share of budget revenue coming from “local areas,” i.e. the provinces and localities. It was planned to reach 26.7 percent of the total state budget in 2017, compared to 23.2 percent in 2016 and a mere 16.1 percent in 2011 when the government started reporting on this item. The planned figure for 2018 is now only 26.1 percent, the first decrease projected. Moreover, in 2017, the related revenue plan was executed at 100.5 percent. It was thus over-fulfilled by only 0.5 percent, which is the lowest value of all budget reports. The over-fulfillment rate had been about 14 percent in 2015 and in 2016, and even 22 percent in 2014. The fact that it suddenly plunged to almost zero and that no more growth is expected for 2018 indicates a trend reversal. In other words, the part of the economy that is not centrally controlled is not growing anymore, at least not in relative terms. Some of the verbal passages in the report indicate that this is the result of a deliberate policy change. While in 2017, the Minister of Finance in his report said that “Provinces, cities and counties envisage ensuring expenditures with their own local revenues and adding their profits to the state budget,” in 2018, he put an emphasis on the central government by saying “the revenue from the central economy holds an overwhelming proportion.” We need to be careful with far-reaching interpretations here, but one could speculate that the central government is concerned about the growing political power of local levels and aims at curbing their economic independence. As argued in last year’s evaluation of the budget report, regional rivalries are a traditional feature of Korean politics and can become a threat to central control. 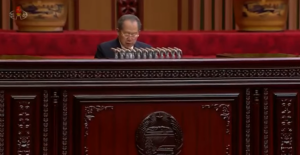 The 2017 session of the North Korean parliament followed more or less the same routine as in previous years. A new aspect was that the state media also reported about a Politburo session during which the budget report has been discussed and authorized. This shows that the Party’s official role in directing the country has been strengthened, and that the already largely ceremonial role of the parliament has not been expanded. In terms of economic policy, we note a number of references to economic sanctions. It is still difficult to assess their actual effects on policymaking, but it is obvious that they are being felt and that the government decided to make this fact public. There was also a greater emphasis on tourism. This corresponds with Kim Jong Un’s New Year’s speech and could reveal a part of North Korea’s negotiating strategy for the upcoming April 27 summit with Moon Jae-in and perhaps also for talks with Donald Trump who had imposed ban on travel by US citizens to North Korea last year. The budget report, as it did last year as well, shows relatively modest growth expectations, which could be a result of reduced economic cooperation with China and of tightened economic sanctions. The figures also suggest a moderate optimism regarding the prospects of Special Economic Zones, which could be another hint at North Korea’s portfolio of demands during the upcoming bilateral talks. The increase in military spending for 2018 is minimal but carries a certain symbolism. This figure is clearly not a reason to expect a forthcoming North Korean delegation in talks about disarmament. A potentially remarkable trend is the stagnating share of budget revenue generated by local units such as provinces and special cities. This could indicate Pyongyang’s concerns about a growing economic independence and, as a consequence, about an increase of political power at the local level.